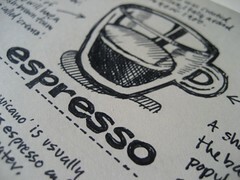 My favorite drink + my favorite sketchnote artist = Must have. Going to get at least one of these soon. Very nice Mike, beautiful illustrations! Set of 3 6X8 on the way. These are my 3 favorite coffee drinks! October 27, 2010 | Brian G.
Thanks Matt & Brian - appreciate you guys picking up a set!